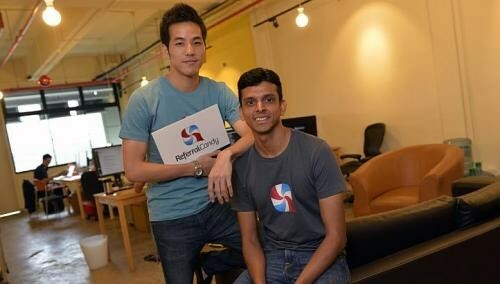 Singapore technology company Anafore has capitalised on a gap in the fast-evolving world of digital marketing. Social media and word of mouth are increasingly used by start-ups and retailers as potent ways to reach new customers. Larger businesses tend to use more sophisticated tools to achieve the same goals. But these tools can come with a hefty price tag, said Mr Dinesh Raju, Anafore's founder. Back in 2009, Mr Raju, now 33, realised he could put his computer science degree to good use and convert that gap in the market into a business opportunity to serve smaller firms. He started the tech company with $5,000 from his savings. About a year later, Mr Raju joined forces with Mr Zach Cheng, also a Singaporean whom he met at Carnegie Mellon University in the United States. The two friends and business partners are the brains behind Anafore's best-selling marketing tool, ReferralCandy. It is a cloud-based application that allows businesses to get customers to tell their friends about stores and captures the data, feedback and referrals digitally. The format of the referral programme can be customised according to options available to the retailer or business owner. And unlike a traditional broadcast advertisement reaching a wide but untargeted audience, ReferralCandy allows businesses to connect with their target audience more effectively. "Small and medium businesses know that word-of-mouth is the main way they get new customers and the software application accelerates that process," said Mr Raju. "ReferralCandy is able to encourage customer referrals, track them and send rewards to those who made the introductions." Even though Anafore's headquarters are in Singapore, Mr Raju and his partner took the unusual path of first marketing ReferralCandy in the US, rather than selling it in the local market. "The US has one of the highest volumes of e-commerce sales and it made sense to test the popularity of our application in that market," explained Mr Raju. "We listed ReferralCandy on e-commerce platform Shopify, which is one of the popular e-commerce platforms businesses use to run their online stores." And that was how their first customer, from the furniture industry, came knocking on their door. Today, US clients account for 60 per cent of their business, and the ReferralCandy software is also used in other countries such as Britain, Australia, Canada, India and Singapore. Clients include stun-gun manufacturer Taser International, travel site Yatra and music lessons network TakeLessons.com. In order to serve its clients, the team works around the clock and has flexible hours. Most of the customer interactions are dealt with by Mr Raju and Mr Cheng. "I think about the business 24/7 and am never done with work for the day," said Mr Raju with a laugh. "But starting a business is like nurturing a child, so you naturally give it your all and your best." He recalls how Anafore's revenue for its first year of operations brought in less than $20,000. Four years on, its annual revenue has grown to a six-figure sum, of which about 80 per cent goes to its bottom line and is largely re-injected into the business. He did not disclose the exact level of revenue and profits. Anafore employs eight full-time staff and rents a unit at Ayer Rajah Crescent, where the team can meet and brainstorm further ideas and improvements. But breaking into and competing in the US market was not the toughest challenge for Anafore, said Mr Raju. Instead, its early days of tweaking its product and coming up with something effective and user-friendly, while pricing it affordably proved to be one of the business' hardest hurdles. "We had little prior e-commerce experience and we were uncertain if the product would satisfy a need," said Mr Raju. He spent a lot of time experimenting with different ideas and prototypes, and spent about $50,000 from his savings to tide Anafore over its first two years. Fortunately, the team's sincerity in wanting to help small firms moved their customers, who "gave them a chance and forgave the Anafore team for the initial lack of features", he said. As more companies go digital, that can mean only good news and more business for Anafore. "Revenue has more than tripled over the past year and we've made millions in sales for our clients," he said. "This couldn't have been possible without my team."